Master Hsuan Hua was the founder the Dharma Realm Buddhist Association (DRBA), a well known Buddhist organization in the United States, Taiwan, and Hong Kong, built the City of Ten Thousand Buddhas in Ukiah, California, one of the first Buddhist monasteries in the United States, and founded the Buddhist Text Translation Society, which works on the translation of scriptures into English. Well known as the first Chinese Buddhist Zen master to bring Orthodox Buddhism to the West, he also ordained the first Buddhist monks in the United States. 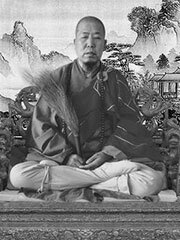 Master Hsuan Hua was the Ninth Patriarch of the Wei-Yang Ch’an (Chinese Zen) School of Buddhism and was granted the Dharma Seal of the Wei-Yang lineage from the Venerable Master Hsu Yun. Master Hsuan Hua often referred to himself as «a living dead person», or «the Monk in the Grave.» He claimed to never want fame or profit, and that he had no desire to contend with others even more so, but instead, said that he would rather be «a little bug,» or «a small ant» beneath the feet of all living beings, and used his body as a stepping stone for living beings who sought to transcend from commoners straight to the ground of the Buddha. Master Hsuan Hua, a native of Shuangcheng County of Jilin Province, was born Bai Yushu on April 16th, 1918. His father was diligent and thrifty in managing the household. His mother was a faithful Buddhist who ate only vegetarian food and recited the Buddha’s name every day. When she was pregnant with Yushu, she constantly prayed to the Buddhas and Bodhisattvas for her well being. The night before his birth, in a dream she saw Amitabha Buddha emitting a light. Shortly after, she gave birth to her youngest son. When the Master was born, supposedly the room was filled with a fragrance. For three days and nights, Yushu cried continuously, a sign of his deep sympathy for beings suffering birth and death in this world. As a child, the Master followed his mother’s example and ate only vegetarian food and recited the Buddha’s name. The Master was quiet and untalkative by nature, but he had a righteous and heroic spirit. At the age of eleven, upon seeing a neighbor’s infant who had died, he became aware of the great matter of birth and death and the brevity of life and resolved to leave the home-life. At the age of 15, he took refuge in the Triple Gem under the Venerable Chang Zhi. That same year he began to attend school and studied texts of various Chinese schools of thought, and the fields of medicine, divination, astrology, and physiognomy. During his student years, he also participated in the Moral Society and other charitable societies. He explained the Sixth Patriarch’s Sutra, the Diamond Sutra, and other Sutras for those who were illiterate, and started a free school for those who were poor and needy. Dressed in the left-home robes, An Tze built a simple hut by his mother’s grave and observed the practice of filial piety. During that period, he made eighteen great vows, bowed to the Avatamsaka Sutra, performed worship and pure repentance, practiced Ch’an meditation, studied the teachings, ate only one meal a day, and did not lie down to sleep at night. An Tze won the admiration and respect of the villagers. His intensely sincere efforts to purify and cultivate himself moved the Buddhas and Bodhisattvas. As news of these supernatural events spread, An Tze came to be regarded as an extraordinary monk. One day, An Tze had a vision that the Sixth Patriarch, Hui Neng came to him and told An Tze that in the future he would go to the west, and that the amount of people he would preach to would be numerous, marking the spread of the Dharma in the west. Huineng then disappeared. When An Tze’s observance of filial piety was completed, he practiced austerities in seclusion. Later he returned to the monastery where his master was once head of, and was chosen to be the abbot. During the period that he lived in Manchuria, An Tze contemplated people’s potentials and bestowed appropriate teachings. In 1946, Hsuan Hua left Guangzhou, and bid farewell to Master Hsu Yun. He went to Hong Kong to propagate Buddhism. Hsuan Hua gave equal importance to the five schools—Ch’an, Doctrine, Vinaya, Esoteric, and Pure Land—thus putting an end to sectarianism. Hsuan Hua also renovated and built temples, printed sutras and constructed images. He lived in Hong Kong for more than ten years. In 1959, Master Hsuan Hua, sought to bring the Dharma to the west, just as what Sixth Patrarch Hui Neng told him many years before. He instructed his disciples back in America to establish a Buddhist association. It was established in the United States under the name Sino American Buddhist Association (later renamed Dharma Realm Buddhist Association). Master Hsuan Hua traveled to Australia in 1961 and propagated the Dharma there for one year. Since the conditions were not yet ripe there, he returned to Hong Kong in 1962. That same year, at the invitation of Buddhists in America, the Master traveled alone to the United States. Master Hsuan Hua first started having regular contact with young Americans who were interested in meditation. Some came to his daily, public meditation hour from seven to eight every evening, and plenty of Americans also attended his sutra lectures. At that time the Cuban missile crisis occurred between the United States and the Soviet Union, and Master Hsuan Hua started to embark on a total fast for thirty-five days to pray for an end to the hostilities and for world peace. By the end of his fast, the threat of war had dissolved. In 1967, Master Hsuan Hua moved the Buddhist Lecture Hall back to Chinatown, locating it in the Tianhou Temple. This marked the end of his «Monk in the Grave» period. In 1968, Master Hsuan Hua held a Shurangama Study and Practice Summer Session. Over thirty students from the University of Washington in Seattle came to study the Buddha’s teachings. After the session was concluded, five young Americans requested permission to shave their heads and leave the home-life, marking the beginning of the Sangha in the history of American Buddhism. Because of the increasing numbers of people who wished to leave the home-life to become monks and nuns under Master Hsuan Hua’s guidance, in 1972 the Master decided to hold at Gold Mountain Dhyana Monastery the first formal, full ordination ceremonies for Buddhist monks and nuns to be held in the West. He invited virtuous elder masters to preside with him over the ordination platform. Two monks and one nun received ordination. Subsequent ordination platforms have been held at the City Of Ten Thousand Buddhas in 1976, 1979, 1982, 1991, and 1992, and progressively larger numbers of people have received full ordination. Over two hundred people from countries all over the world were ordained under him. Having traveled to Thailand and Burma in his youth to investigate into the Southern Tradition of Buddhism, Master Hsuan Hua was set to heal the two thousand year old rift between the Northern (Mahayana) and Southern (Theravada) traditions. In America, Master Hsuan Hua encouraged cordial relations between the Sangha communities from both the Northern and Southern traditions. As always, he would set an example by leading the way. For example, on the occasion of the opening ceremony for the Dharma Realm Buddhist University, he presented Venerable K. Sri Dhammananda of the Southern Tradition with an honorary Ph.D.
Master Hsuan Hua would also invite Bhikshus from both traditions to jointly conduct the High Ordination. From July 18 — 24, 1987, Master Hsuan Hua hosted the Waterland Dharma Function, the largest Buddhist service that can be held, at the City of Ten Thousand Buddhas and invited nearly 100 Sangha members from mainland China to attend. This was a historical assembly symbolized by the cooperation between the American Sangha and the Chinese Sangha. On November 6 1990, Master Hsuan Hua sent his disciples to Beijing to bring back the Long Zang edition of the Buddhist canon back to the City of Ten Thousand Buddhas, thus symbolizing the taking of a further step in the relationship between Chinese and American Buddhism and the transmission of the Buddha’s teachings to the West. From January 8 — 20, 1991, at the invitation of Mingru Monastery in Jilin, China, the Master sent several of his disciple nuns to reside as visitors, where they participated in the daily monastic life and gave talks on Dharma to the public and talks on the precepts to the resident nuns. On December 12, 1995, Venerables Heng Sure, Heng Lyu and Heng Bin went to Shanghai, China, to take part in the transmission of the Complete Precepts at Longhua Monastery at the invitation of Venerable Ming Yang. In May 1990, when Master Hsuan Hua sent five monks to the Longhua Monastery in Shanghai, China, to help administer the Ordination Ceremony, President Bush sent a fax to the City of Ten Thousand Buddhas congratulating him and his disciples. On April 28th, Master Hsuan Hua accepted the invitation of President Bush and went with eighteen members of the Dharma Realm Buddhist Association to attend the President’s dinner in Washington, D.C. In 1994, the Master advised that if the President would refuse to take a salary, he would certainly win the election. Master Hsuan Hua was always concerned of the welfare of all nations. For that, he was respected by many leaders from many parts of the world. Whenever Master Hsuan Hua spoke to them, he would always exhort them to work for the benefit of the society and nation. Many Chinese and Taiwanese leaders have paid their respects to him. Among them are the Minister of Justice, Lin Yang Gang, the ex-Premier of Vietnam, Shan-chyan Chen, Liang Surong, the former President of Taiwan and others. Master Hsuan Hua had become so sick he couldn’t even climb a single step. Even when the doctors diagnosed that he had only seven days left to live, Master Hsuan Hua refused to rest or seek treatment. Leaning on his cane and riding in a wheelchair, he continued to speak the Dharma in various places. He then became so ill that he couldn’t get up from the bed, yet he still instructed his disciples over the phone or appeared in their dreams to teach them. Finally, he collapsed from illness. Master Hsuan Hua’s funeral lasted from June 8th to July 29th. On June 12th, his body was placed in the casket at a branch monastery in Long Beach. Memorial services were held at the monastery. On June 16th, ceremonies were held for his sending to Amitabha’s Pureland and the moving of the casket. On June 17th, Master Hsuan Hua’s casket made it to the City of Ten Thousand Buddhas. His casket was moved into the Hall of No Words. From June 17th to the 28th, more memorials services were held. On July 28th, Masters from both Theravada and Mahayana traditions hosted a ceremony for inviting the Venerable Master from the Hall of No Words to the Patriarchs’ Hall in front of the Jeweled Hall of Ten Thousand Buddhas. The two thousand and some followers from the United States, Canada, and various Asian and European countries, including many of Master Hsuan Hua’s American disciples, came to the City of Ten Thousand Buddhas to take part in the funeral service for Master Hsuan Hua. Letters of condolences from Buddhist monks and dignitaries, including President George H. W. Bush, were read during the memorial service. The cremation began at 1:00 in the afternoon. Two thousand disciples and admirers lined up and walked into the Patriarchs’ Hall one by one to gaze upon Master Hsuan Hua for the final time. At three o’clock, Master Hsuan Hua’s casket was carried to the cremation site by a procession of over two thousand people. At 4:20, Master Hsuan Hua’s body was cremated. His disciples all sincererly knelt and bowed, bidding farewell to their spiritual teacher. All watched mournfully as the remains were burned. A day after the cremation, June 29th, Master Hsuan Hua’s ashes were scattered in the air above the City of Ten Thousand Buddhas by two disciples in a hot air balloon, fulfilling Master’s wish, «I came from empty space, and to empty space I will return.» This was the most emotional event of Master Hsuan Hua’s forty-nine day funeral. Even cries of «Master, don’t go!» could be heard when his ashes were scattered. The vast majority of the disciples continued solemnly reciting the name of the Buddha, completing the funeral. According to a tradition in Buddhism, a person can be proven to be enlightened if upon their death the bone remains have obtained a patina which makes them look like gems. This is known as sharira. Master Hua’s bones did in fact become covered in a patina and this was regarded as evidence that he was indeed fully enlightened. About 4,000 to 10,000 of Master Hua’s sharira seeds were found after his ashes were scattered, among them included teeth sharira. The many sharira that were found consisted of many colors of white, light yellow, green, blue, sky blue, light blue, black, pink, silver, and other colors. Some of the sharira which were formed on the bones even gleamed like green jade. Master Hua’s relics were distributed to the many temples his organization founded. The rest are now kept in the Hall of No Words where he laid in state during the 49-day mourning period. While many remember Master Hsuan Hua as the monk who introduced Chinese Buddhism to America, he is remembered by many of his disciples for his ability to speak the Dharma. Some people have likened Master Hua’s propogation of Dharma in the United States to the patriarch Bodhidharma‘s journey eastward to bring the treaure of Dhrarma to China, and to Xuanzang‘s journey westward to bring the sutras back to China. Master Hua had denied this praised in the years before entering stillness. His life has been one of hardship and distinctive achievement. He endured what others couldnt not take, which is probably why his strict observence of the precepts is well known by the Buddhist community. Nevertheless, many will remember Master Hua as the eminent monk of today’s world, the Buddhist specialist, the leader of sutra translation, and as an educator.